Manly Monday: Mail Room Barber Co.
Robert Watkins is a Master Barber from Florence, South Carolina. He's also a master at creating a career path that is on point and on purpose. After learning to cut his own hair, he quit his job as a barista at Starbucks and began cutting hair for friends- which turned into a job at the Trendsetters Barber Lounge. When he was exposed to the the reality of human trafficking and the role we all play in buying products that are made with cheap, slave labor, he decided to do something about it by crafting his own products in a socially, responsible way. He started the Mail Room Barber Company, which is all about quality grooming products made in small batches using fair trade and ethically sourced ingredients. The first product he created was a high quality, functional pomade, which he now offers in three versions; Natural, Forest and Classic. The pomades range from a light to a thick hold that are as easy to sculpt as they are to rinse out. Ethically sourced ingredients like castor oil, soy wax, mango butter and coconut oil are meant to moisturize and soothe the hair and scalp. They have fantastic manly scents too- like a fresh forest, pipe tobacco or oak moss and cypress to name a few. 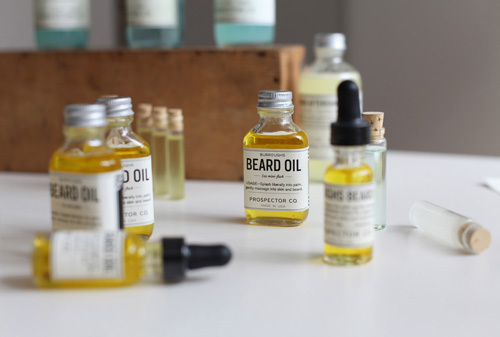 Robert's collection of manly wares for hair, beard and skin keeps expanding and because of his passion to source quality ingredients that help combat human trafficking, I can't help but want to buy each and every item for the guys in my life. See his entire shop, here. All of their quality products are named after prolific people, places or things. This Burroughs Beard Oil has a woodsy, earthy scent, perfect for the rugged, outdoor type. It's aptly named after American naturalist and essayist, John Burroughs who once wrote, "We readily attribute some extra virtue to those persons who voluntarily embrace solitude, who live alone in the country or in the woods, or in the mountains and find life sweet..."
The K.C. Atwood Aftershave is named after America's citrus pioneer, Kimball Chase Atwood. For this invigorating concoction, grapefruit and sweet orange are combined with witch hazel, aloe, sandlewood, lime and coriander. Their second offering is the uber manly Perry and Henson Aftershave, named after Robert E. Peary and Matthew Henson, who in 1909, were the first explorers to reach the North Pole. Their rugged nature and deep desire for adventure and exploration makes them an excellent namesake. The color is arctic blue and its scent of bay leaf and coriander mix refreshingly well with witch hazel, cedar water and aloe. Beau Brummell was born in 1778 and as stated on Wikipedia, is credited with "introducing and establishing as fashion the modern man's suit, worn with a tie." 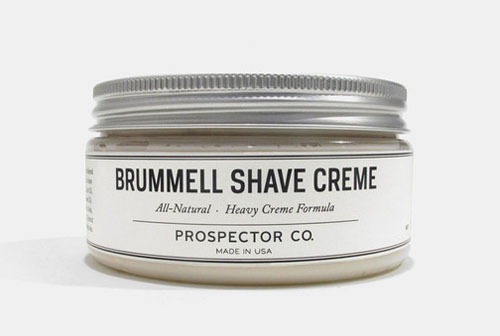 This Shave Creme has been perfected over time and as Brummell would admire, it deeply enhances a man's grooming experience. As stated on the Prospector Co. site, its "all-natural composition of ingredients, from fatty butters to organic argan oil, makes for a very rich and smooth shave." These light, manly scents were created using an age old perfumer's technique. Cedar St. Tavern, (where prolific writers, painters and musicians once regularly congregated in Greenwich Village) has scents of patchouli, oak moss, tonka bean and lavender. Gabardine 1879, (a classic fabric by the same name) is a mix of oak moss, tonka bean, pettigrain and other pure essential oils. I like this product idea. The Pugilist Rag Soak is inspired by the rough and tumble pugilists of the 1800's who "used clinched fists and spiteful tongues to get what they wanted, inside and outside the ring." Inspired by the smelling salts that helped them rebound after a tough battle, this mixture delivers a powerful yet calming punch. As recommended on their site, "Use on a warm rag for an extra relaxing pre-shave pore softener or at a hard day's end." To get the full Prospector Co. experience, may I suggest the Tester Vials Kit. Inside this cute tin, I mean manly tin, you'll find smaller doses of all of Prospector's popular shaving products. See all of their fabulous shaving and skin care goods for the modern man here....and happy Manly Monday.